Last week, the National Resident Match Program released its annual data report on the most recent fellowship match for positions to begin in July 2019. The fellowship matches take place between May 2018 and January 2019, with different match days for different specialties. The NRMP releases a summary of all of the specialty match results in February each year. By analyzing the data, you can learn a lot about which specialties are attracting new physicians and which ones are not attracting new physicians. And projecting forward, you can predict which specialties are going to have shortages of practitioners in future years. The 2019 year had the most positions ever offered in the U.S. (10,936), the most fellowship programs ever in existence in the U.S. (4,750), and the most residents who matched into a fellowship program in the U.S. (9,378). Because the hospital I practice in primarily has internal medicine specialists, I am particularly interested in the outcome of the various internal medicine specialty fellowship matches. This table in blue shows the number of internal medicine fellowship positions by specialty. They vary widely from a low of adult congenital heart disease (9) to a high of cardiology (951). 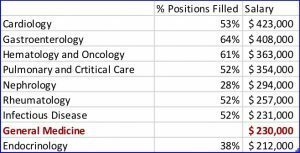 Oncology-only fellowships and hematology-only fellowships generally have very small numbers of available positions because most physicians tend to go into combined hematology and oncology fellowships. 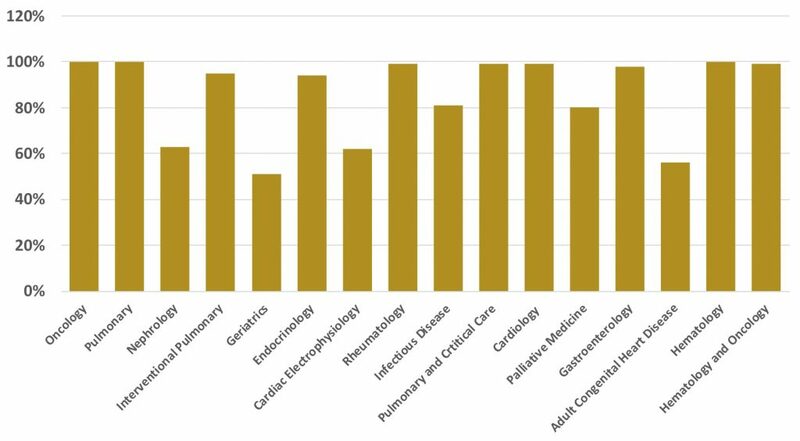 Similarly, there are few pulmonary-only fellowships because most candidates go into a combined pulmonary and critical care fellowship. 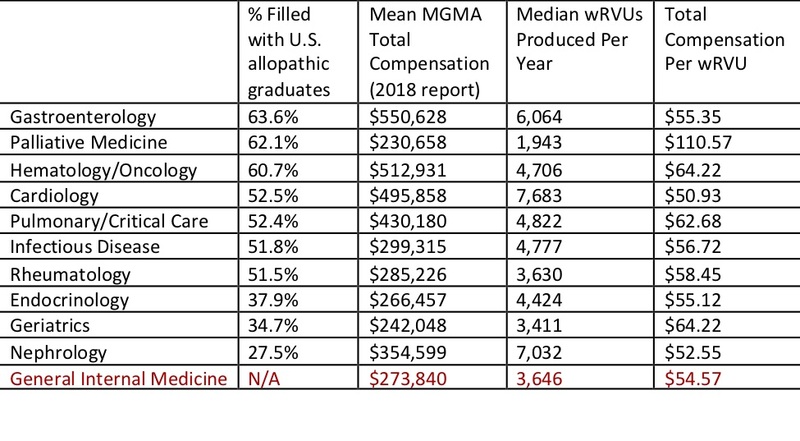 The NRMP also reports the percentage of available positions that fill with U.S. allopathic (MD degree) medical school graduates, as shown in this table in red. Eliminating oncology, hematology, and pulmonary from the analysis because most doctors interested in those fields do a combined fellowship, it becomes clear that the most popular specialties are hematology & oncology, gastroenterology, and palliative medicine (adult congenital heart disease, interventional pulmonary, and cardiac electrophysiology are only done after a doctor has already completed a pulmonary or cardiology fellowship and are thus sub-specialty fellowships). The least popular fellowships are nephrology, geriatrics, and endocrinology. Next, lets look at the how all of the various specialties filled when including not only U.S. allopathic graduates but also U.S. osteopathic (DO) graduates, U.S. citizens who attended foreign medical schools (most frequently Caribbean medical schools), Canadian medical school graduates, and foreign medical school graduates. Here, in the table in brown, we see that most fellowships eventually filled. However, nephrology and geriatrics are notable exceptions. So, why are certain specialties so unpopular? One factor may be salary. 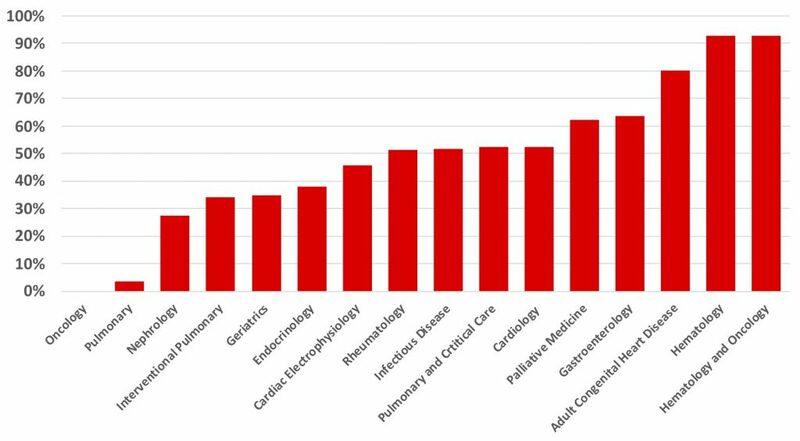 Using the 2018 Medscape Physician Compensation Survey data, the internal medicine specialties with the highest salaries also had the highest percentage of available fellowship positions filled with U.S. allopathic medical school graduates (cardiology, gastroenterology, and hematology/oncology). 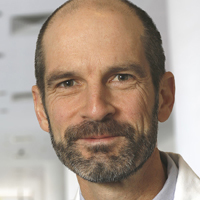 Endocrinology is notable because the annual salary of an endocrinologist is less than a general internist, meaning that for the personal cost of doing 2 additional years of fellowship training in endocrinology compared with a general internist, you get to make $18,000 less than a general internist – not surprisingly, relatively few of the endocrinology fellowship positions were filled by U.S. allopathic medical school graduates. Another way of analyzing salary and work effort is from the annual MGMA Physician Compensation Report. The 2018 report is the most recent and it reflects 2017 data. There are important differences between the MGMA compensation data and the Medscape compensation data. The MGMA report only includes large group practices, is reported by practice managers, and reflects total compensation. The MGMA report has data on private practice physicians (who make more) separate from academic physicians (who make less). On the other hand, the Medscape report includes any physician, is self-reported by the physician, and represents salary (which may not be the same as total compensation). The Medscape report includes both academic and private practice physicians. The MGMA data is probably more accurate but represents a skewed population of doctors. The Medscape data is probably less accurate but in theory is more representative of the average doctor (or at least those who are willing to take the time to fill out the survey). This table reflects just the MGMA private practice data. From the MGMA report, it is apparent that based on median wRVUs, nephrologists work very hard, in fact, harder than any other specialists except cardiologists. However, they make $140,000 less than cardiologists. When the MGMA data is expressed as total compensation per wRVU, it appears that nephrologists make the second lowest amount of money per wRVU compared to other specialists (note that the MGMA total compensation per wRVU is calculated with a complicated equation and that not all practices report both total compensation plus wRVUs so the reported values will be different than if you simply divide the mean total compensation by the median wRVUs for any given specialty). There is a pretty sharp demarcation between the lowest paid specialties (geriatrics, endocrinology, rheumatology, infectious disease, and nephrology) and the highest paid specialties. 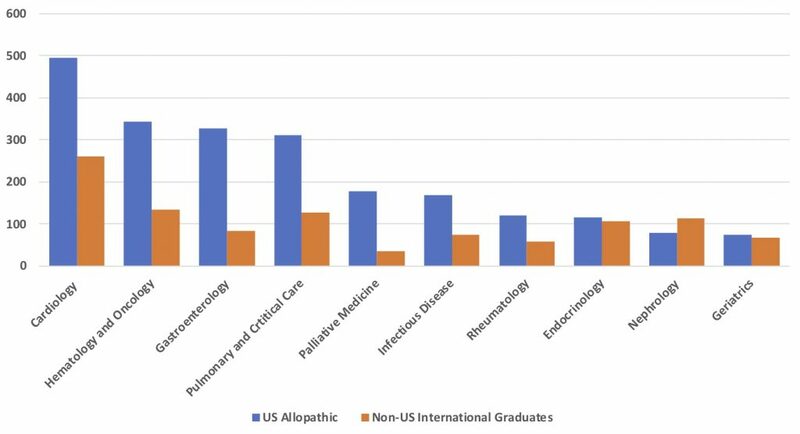 The lowest paid specialties had the lowest percentage of fellowship positions filled with U.S. allopathic medical graduates. The one exception to this is palliative medicine but palliative is unique in that palliative physicians make about twice as much income per wRVU at $110.57 than the other specialties. Another reason why newly trained residents may choose one specialty over another is how happy the physicians are in a given specialty. The 2018 Medscape Physician Compensation Report also has information on job satisfaction of physicians, including a survey question of “Would I choose the same specialty again?”. Once again, there is a relationship between job satisfaction and the percentage of residents who choose that specialty. The least happy internal medicine specialists are nephrologists (in fact, per the Medscape survey, they are the least happy specialty of all physicians, not just internal medicine specialties). Nephrology is also the specialty that filled the least of available positions with U.S. allopathic medical school graduates. So, if you choose to do 2 additional years of training compared to a general internist, you are rewarded by being 30% less happy with your job than a general internist. On the other hand, the three specialties with the most satisfied physicians are also the 3 specialties with the highest percentage of fellowship positions filled with U.S. allopathic medical school graduates (hematology/oncology, cardiology, and gastroenterology). As we project the results of this year’s fellowship match into the future, we should anticipate future physician shortages in nephrology, geriatrics, infectious disease, and palliative medicine. Additionally, we should anticipate that there will be more nephrologists who are foreign medical school graduates than U.S. allopathic medical school graduates in the future based on the total number of U.S. versus foreign medical school graduates filling fellowship positions this year. Endocrinology and geriatric medicine are not far behind and in the future, your endocrinologist and geriatrician will probably be more likely to be an immigrant from another country than a graduate of a U.S. medical school. If American medicine was an entirely free market economy, then as the supply of nephrologists, geriatric physicians, infectious disease physicians, and palliative medicine physicians goes down, then their salaries should go up. But physician supply and demand is complex and since it can take many years to train enough physicians to fill a specialty with a physician shortage, we may be looking at a medical economy with too few nephrologists, geriatric physicians, infectious disease physicians, and palliative medicine physicians for years to come. An alternative explanation is that we have too many fellowship positions open in these specialties and that academic medicine is out of alignment with the needs of American medicine. Academic medical centers tend to create fellowship positions based on the needs of the individual divisions and departments within a given medical center and not necessarily based on the needs of the medical economy as a whole. This can also contribute to a misalignment of specialist supply and demand. One thing seems certain, however. American nephrologists are less happy with their job, work harder in terms of wRVUs, and are compensated less per wRVU than other physicians. 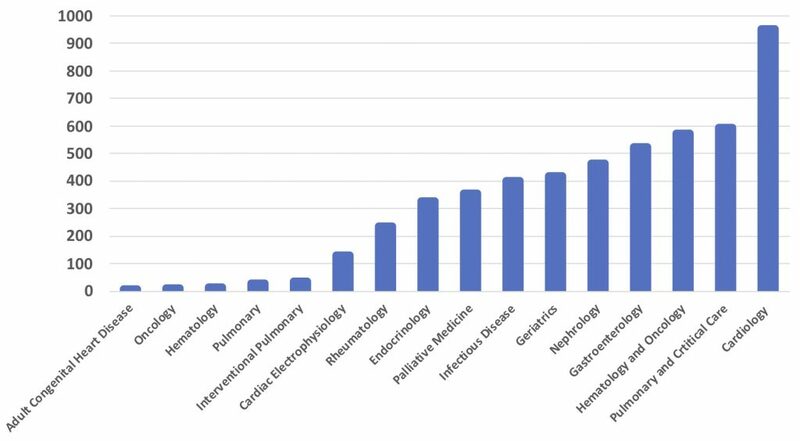 I believe that these are the reasons why so few physicians are entering the nephrology fellowship match and why so few nephrology fellowship positions filled in this year’s fellowship match. To insure that our patients’ medical needs are met in the future, hospitals will need to be sure that their nephrologists are happy and are compensated appropriately for the work that they do. On the other hand, gastroenterologists, hematology/oncologists, and cardiologists are the happiest and most highly compensated and this may explain why these three specialties filled so well in this year’s match.